Which fighter will the Indians choose? The competition for the multibillion-dollar contract to supply all-purpose fighter jets to the Indian Air Force is hotting up. America is making some strong moves, Europe is honing its lobbying potential, and Russia, too, is nursing hopes of winning. India’s Medium Multi-Role Combat Aircraft (MMRCA) tender to select a replacement for the MiG-21 remains the focus of the aviation experts’ attention. New Delhi might make a final decision as soon as the middle of this year. The country’s Ministry of Defence has set aside more than $9 bn to pay for a total of 126 aircraft. Half of them are reserved for an offset agreement, meaning that the orders must be filled in India by Indian firms. This is a novelty, as New Delhi has never before set the offset threshold above 30%. Six machines are in the race for a place on the Indian Air Force’s fleet: the American F-16IN Viper (by Lockheed Martin) and F/A-18E/F Super Hornet (by Boeing), the Pan-European (essentially British/German) Eurofighter Typhoon, the ill-fated Dassault Rafale from France, the Swedish JAS-39NG Gripen (by SAAB) – a fixture at all recent tenders, and the Russian MiG-35. So what are their individual ratings before the final push? Let us start with the simplest. The Rafale traditionally appears an outsider and its outlook is, indeed, not impressive. Its huge technology transfer package does not help either: For example, Paris has promised New Delhi the latest RBE-2AA radar equipped with an active PAA (not yet delivered even to the French Air Force) and has thrown in a promise of complete on-board radar codes for good measure. The Gripen is just as exotic for the Indian market. Not over expensive, the Swedish offering is rounded off with a nice set of on-board equipment, also including an APAA radar. Unlike the Rafale however, the Swedish fighter has made some headway in recent years, with sales also including Eastern Europe (the Czech Republic and Hungary), South Africa, and Thailand. That said, the Nordic offering is fraught with a lot of problems. The Griffin’s outlook as a platform for at least 30 years to come is rather uncertain, as are the chances of its comprehensive overhaul over that period. The Indians’ unfamiliarity with Swedish aircraft in general also seriously undermines SAAB’s positions. The Eurofighter Typhoon, a product of United Europe, looks quite competitive. It is a competent aircraft with excellent avionics whose manufacturers have already secured export contracts from Austria and Saudi Arabia. Any offset agreement involving the Eurofighter Typhoon is likely, though, to be highly convoluted: assembly in India of the Hawk training plane under licence from BAE, one of the fighter jet’s developers, has long been under discussion. But this whole area appears rather problematic at the moment. 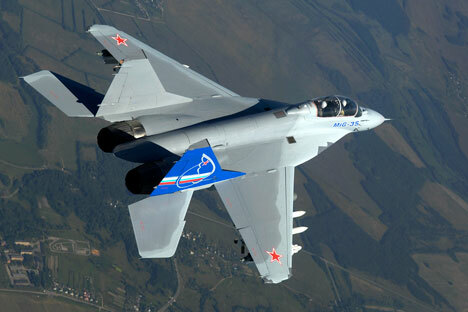 The United States has presented two fighter jet models at the MMRCA. The F-16IN Viper, also known as the F-16 block 70, is a further modification of the F-16E block 60 Desert Falcon, equipped to meet the standards expected of an all-purpose assault aircraft. The F-16 has long been well known around the world and its arguably most advanced version, specially equipped to strike against ground targets, is now offered for sale. The Lockheed machine’s karma is tainted, though, by its manufacturer’s long-standing ties to Pakistan, which makes quite wide use of the F-16. Lockheed’s positions are also considered weak in terms of possible ways to meet the offset manufacturing requirements. The second American fighter apparently stands a much better chance. Initially, Boeing offered its F/A-18E/F Super Hornet for the tender. This is equipped with the serially-produced APAA-based AN/APG-79 radar, which aroused a lot of interest on the part of the Indian military. It also easily meets the carrier-basing requirements. The Super Hornet also has the advantage of an agreement, signed late last year, for localising the manufacture of the F414 engines. Those engines are, of course, intended for installation on the Tejas but this arrangement could also be used to meet the offset requirement for Super Hornet supplies. At the Aero India 2011 show, held last February in Bangalore, Boeing showcased its new upgrade package, the so-called Silent Hornet. The fighter has reportedly been outfitted with elements of reduced radar visibility, conformal fuel tanks, an internal weapons compartment, and new on-board radio and electronic equipment. Russia’s successful track record on India’s aircraft market has been traditionally linked with Sukhoi jets; for Mikoyan, the MMRCA represents a vigorous post-Soviet debut of sorts. Obviously, India has bought the carrier-based MiG-29K as well, but the volumes of Su-30MKI supplies dwarf those deals hands down. On-board electronic equipment is a strength of Mikoyan’s offering: the aircraft will be supplied with the pre-installed Zhuk-AE APAA-equipped on-board radar. The offset prospects also look good: India has already localised manufacture of the third-generation RD-33 engines for these same MiG-29Ks, which is now easy to retool or expand to accommodate the MiG-35’s RD-33MK. The fighter’s manoeuvrability is also assessed as excellent. The Russian proposal has the value advantage as well, with the MiG-35 being among the cheapest aircraft competing in the tender.